While much media coverage the last several days sought to contrast recently deceased former president George H.W. Bush and current president Donald Trump, Arun Gupta was on the podcast “Intercepted,” making parallels between the two presidents. Gupta argued that the Trump presidency was largely an outgrowth of past presidencies, especially that of George H.W. Bush. On Thursday, USA Today reported that William Barr “is a leading candidate to become President Donald Trump’s replacement for ousted Attorney General Jeff Sessions, two administration officials and a person familiar with the discussion told USA Today on Thursday.” Barr worked at a time for the CIA, including while Bush was CIA director. Barr was also attorney general during the Bush administration. Specifically, he was attorney general in 1992 when Bush pardoned six individuals implicated in the Iran-Contra scandal, including Caspar Weinberger, Elliott Abrams and Robert C. McFarlane. On Wednesday, Gupta was on the “Intercepted” podcast “George H.W. Bush (1924-2018), American War Criminal,” hosted by Jeremy Scahill. He is writing a piece for The Intercept on George Bush, the secret government, and the Iran-Contra scandal. Background: The Iran-Contra affair involved the Reagan-Bush administration trading missile sales to Iran for U.S. hostages, and using the proceeds of those arms sales to fund anti-Sandinista Contras in Central America — in violation of U.S. law. Consortium News founder Robert Parry (whose books include Secrecy & Privilege: Rise of the Bush Dynasty from Watergate to Iraq) would later write in “Firewall: Inside the Iran-Contra Cover-up“: “The Republican independent counsel [Lawrence Walsh] infuriated the GOP when he submitted a second indictment of Weinberger on the Friday before the 1992 elections. The indictment contained documents revealing that President Bush had been lying for years with his claim that he was ‘out of the loop’ on the Iran-Contra decisions. The ensuing furor dominated the last several days of the campaign and sealed Bush’s defeat at the hands of Bill Clinton. “Walsh had discovered, too, that Bush had withheld his own notes about the Iran-Contra Affair, a discovery that elevated the President to a possible criminal subject of the investigation. But Bush had one more weapon in his arsenal. 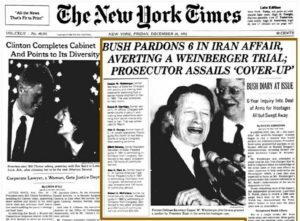 On Christmas Eve 1992, Bush destroyed the Iran-Contra probe once and for all by pardoning Weinberger and five other convicted or indicted defendants.